A lot has happened this last year from: having a 4th child to moving to a different town (still within Texas). 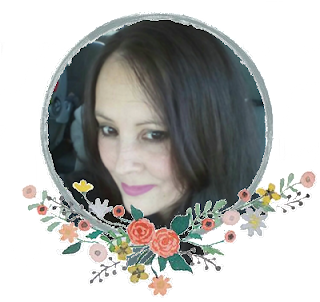 Life happens right...... but I really wanted to get back on track and blog a little bit more. 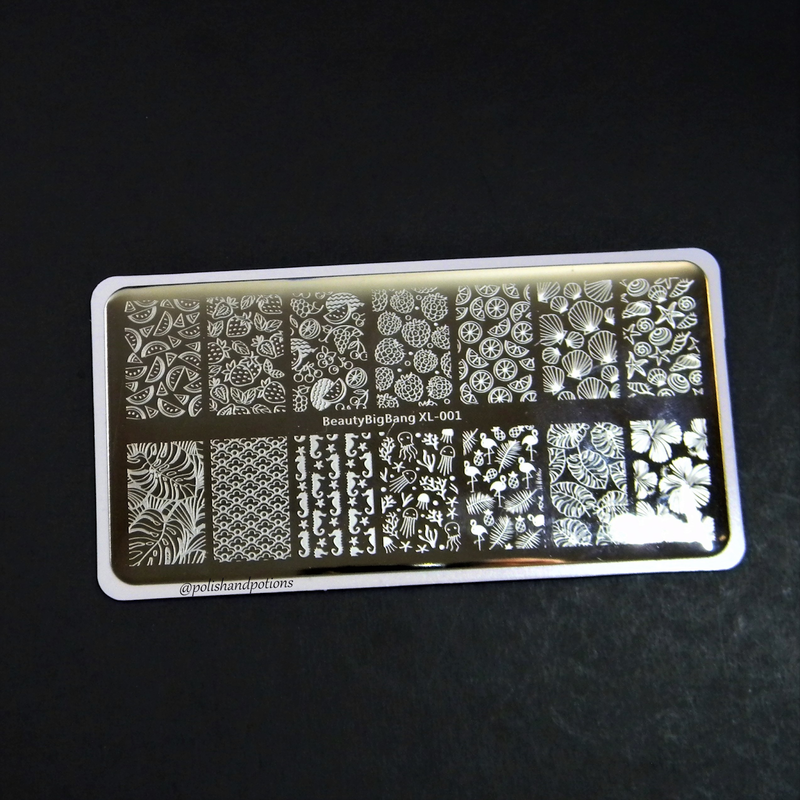 For the last year I've shared my nail art on Instagram, Facebook and left my blog behind; a couple of weeks ago I received an email from the Beauty Bigbang PR, she reached out to me to see if I would be interested in reviewing some stamping plates, I replied saying I would love to. I'm always looking forward to adding new stamping plates to my collection plus it gave me the perfect excuse to blog again. The company is new to me and I was asked to choose a few items to review from the website. I was pleasantly surprised with a lovely landing page, and a tidy well organized e-store. Once I figured out where everything was located, I went directly to the "Nails" section and from there to "Stamping." 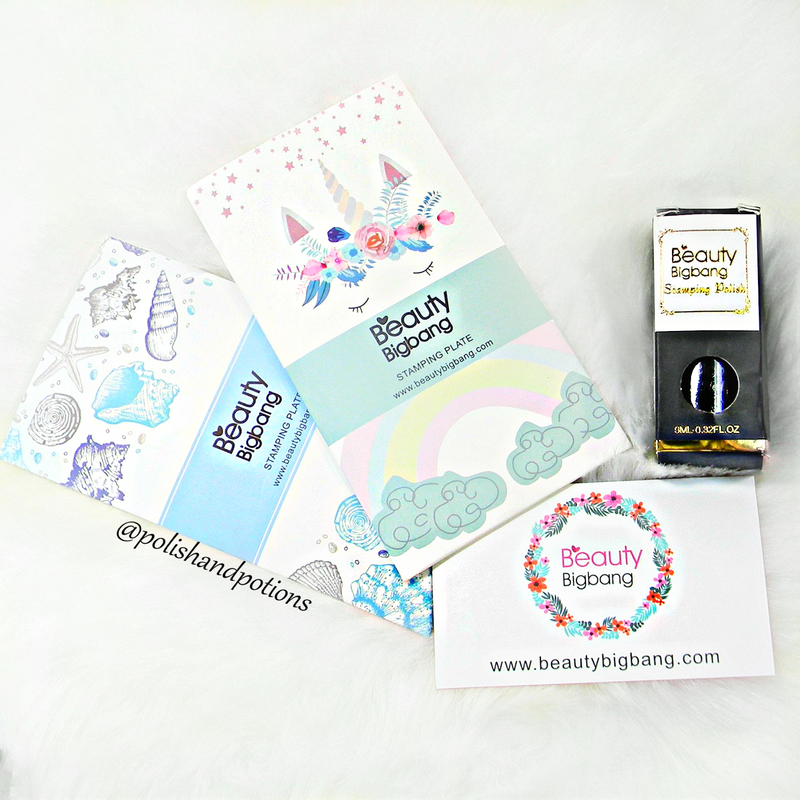 I chose to review 2 of their new plates: XL-001 and 007 and a black stamping polish. 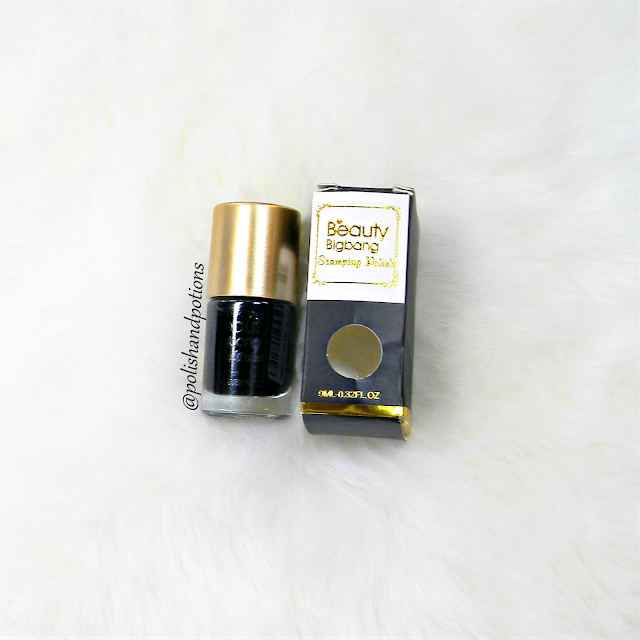 The Stamping polish comes in sleek black matte cardboard box with white and gold accents. The cylindrical bottle is paired with an old gold matte cap which keeps the bottle symmetrical. The number 002 can be found at the bottom of the bottle and on top of the box. The bottle contains .32 Fl Oz. or 9 ml of product. The polish is highly pigmented, thick and dries slowly, giving you some extra seconds to pick up the image and apply to the nail. The brush is short and with the polish all over it, I couldn't really see the shape of it. You can find the 002 black polish here. The plates are well and evenly etched, I had no problems picking up the images, they have a wide variety of patterns, designs and single images. Right now my nails are long (about 2 cm from the cuticle to the tip) and the full nail designs cover all the nail surface. The plates come in a customized cardboard sleeve with beautiful eye catching graphic motifs. I usually discard the sleeves but I think I'm keeping both of them. The plate XL-001 has a tropical theme, with everything you can dream of in a summer vacation, from fruits to shells. With 14 different patterns it allows you to create several nail designs or mix and match the designs in one manicure. The full nail images size are: 1.5cm or 2/16 inches wide and 2.4cm or 15/16 inches tall. 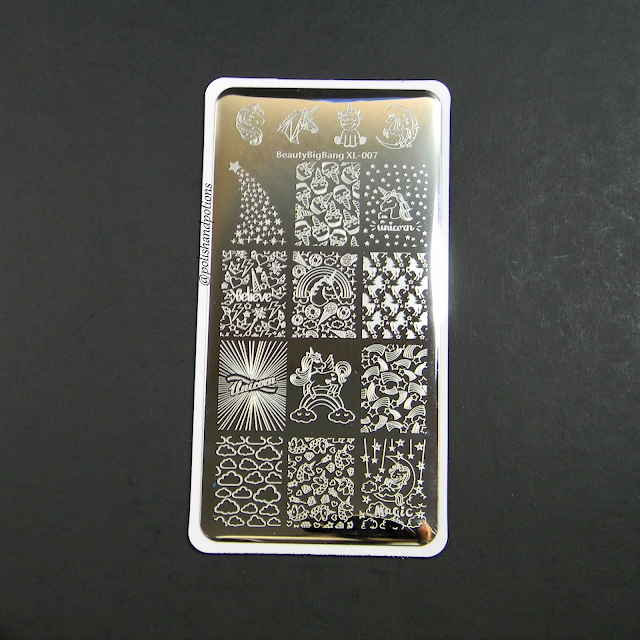 For the design above I used a silver holographic base and Beauty Bigbang XL-001. You can find the plate here. 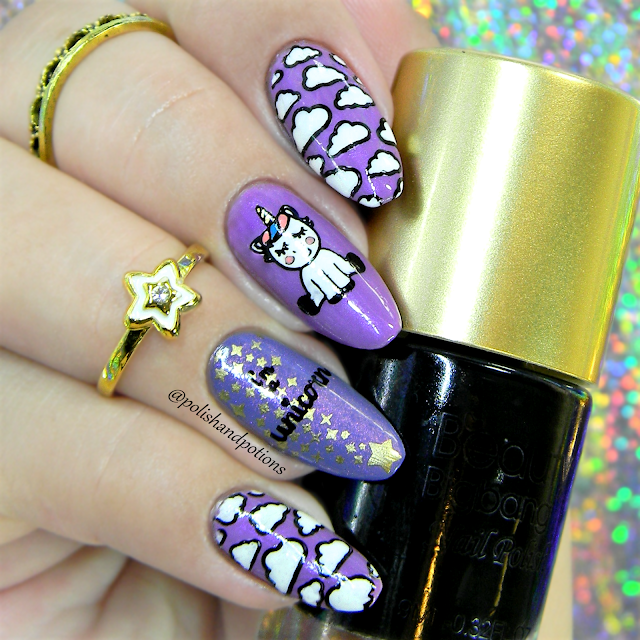 I started the design above with Sinful Colors in 2 different shades of purple and used 2 different toppers to add more depth, the clouds and the unicorn are reverse stamping. I stamped the stars with a gold polish and on top the words: "I'm a Unicorn" with the black stamping polish. 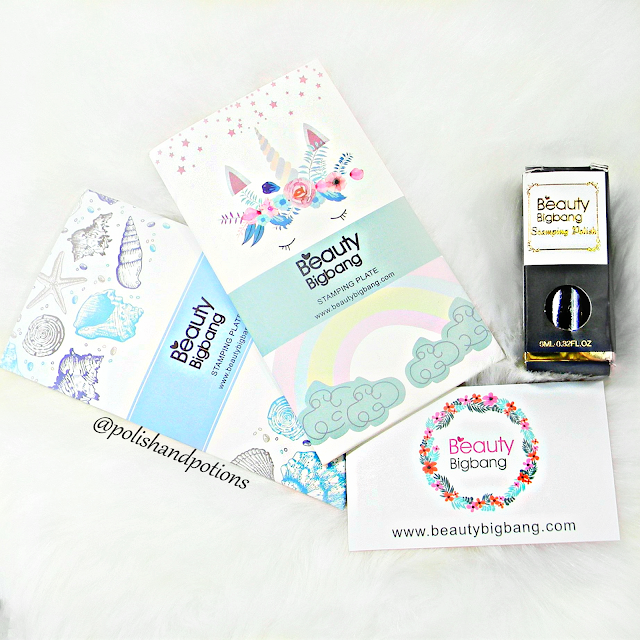 So far I'm really enjoying the Beauty Bigbang products and hopefully this review will help you to add some of their goodies onto your wishlist, did I mention how affordable their prices are? If you decide to buy some stamping plates, polish, brushes, glitter, etc. Use my discount code for a 10% off "POTIONS". Social Media: Instagram and Youtube ! Color Club: Don't Harp On It. The products in this post were provided for an honest review. PS.If you're interested to see more of my nail art (the good ones and the fails too), you could either stalk me on Instagram or Facebook and please remember English is not my first language and I would appreciate an email if you spot any grammatical horrors (error like: spelling, diction or syntax). I may need to pick these up! I love both of them! OMG I need you to pull a simply nailogical and peel those uni nails off and send them to me. I’ll embed them in resin and keep forever! Absolutely love these. 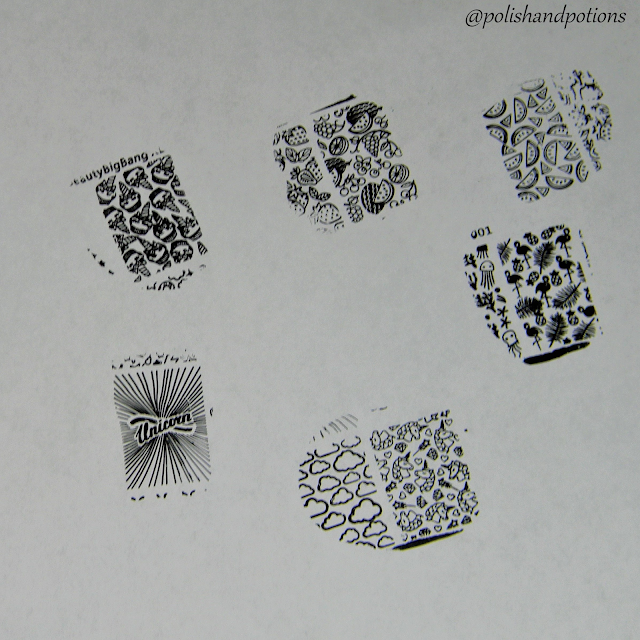 Your stamping turned out beautifully! Both of those plates are adorable! Going in my cart! Metallic snowflakes Winter nail art.